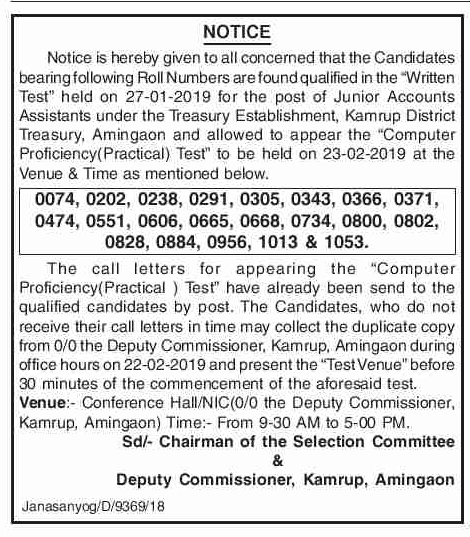 Notice is hereby given to all concerned that the Candidates bearing following Roll Numbers are found qualified in the "Written Test" held on 27-01-2019 for the post of Junior Accounts Assistants under the Treasury Establishment, Kamrup District Treasury, Amingaon and allowed to appear the "Computer Proficiency( Practical) Test" to be held on 23-02-2019 at the Venue & Time as mentioned below. The call letters for appearing the "Computer Proficiency(Practical ) Test" have already been send to the qualified candidates by post. The Candidates, who do not receive their call letters in time may collect the duplicate copy from 0/0 the Deputy Commissioner, Kamrup, Amingaon during office hours on 22-02-2019 and present the "Test Venue" before 30 minutes of the commencement of the aforesaid test.